“…This sweet story will resonate with preschool age children, especially those children who have older siblings to compare themselves to and who often feel or are told that they are too young to do certain things. The activities in Ben’s day are common in the lives of many preschoolers and will feel familiar…. 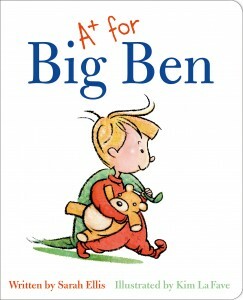 A+ for Big Ben is a charming story of growing up, but not necessarily as fast as one might like. In particular, it will resonate with preschool aged children who always want to grow up and be just like the big kids. This would be a good purchase for public libraries and other libraries that serve children in the preschool age group.